(MENAFN - UkrinForm) Russia and Russian-backed armed formations are responsible for the shooting down of an OSCE SMM long-range UAV near the border with Russia on October 27, according to a statement on the security situation in Ukraine made by the European Union at a meeting of the OSCE Forum for Security Cooperation in Vienna. "These facts suggest Russia and the armed formations it backs bear responsibility for the incident and demand an explanation by the Russian Federation," the statement reads. The EU emphasized that any interference with SMM technical equipment "goes against the letter and spirit of the Minsk agreements." "Those responsible for any willful damage, destruction or loss of SMM UAVs and other assets should be held accountable, both politically and financially," the statement said. It recalls that in its preliminary assessment, the SMM concluded that the most likely cause of the downing was an impact to the UAV and that eight people heard an explosion in the area around the time of the incident. Moreover, the downing followed shortly after the spotting by the UAV of a surface-to-air missile system 9K33 Osa, as well as yet another convoy of seven trucks driving toward Manych on a dirt road near the border with the Russian Federation where there are no border crossing facilities. 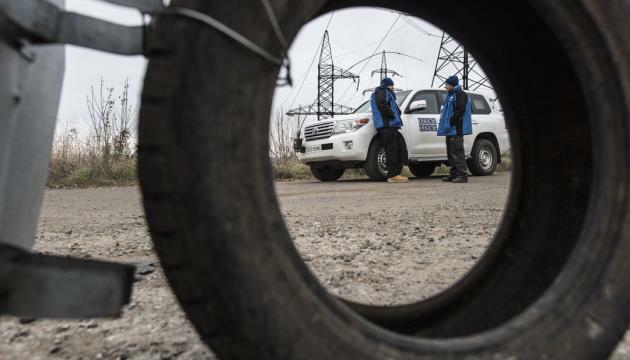 "This incident has also to be seen against the background of continued, systematic restrictions to the SMM´s freedom of movement, occurring predominantly in areas held by Russia-backed armed formations, and constraints to the SMM's proper monitoring of the situation along the uncontrolled Ukrainian-Russian state border," reads the EU statement. The Candidate Countries the Former Yugoslav Republic of Macedonia, Montenegro and Albania, the EFTA countries Iceland, Liechtenstein and Norway, members of the European Economic Area, as well as Ukraine, Moldova, Georgia, Andorra and San Marino align themselves with this statement. As reported, at 01.18 on October 27, while flying over an area near Kalynove (non-government-controlled, 72km east of Donetsk), an SMM long-range unmanned aerial vehicle spotted a surface-to-air missile system (9K33 Osa) and a fuel truck east of Nyzhniokrynske (non-government-controlled, 66km east of Donetsk). Later, the UAV spotted a convoy of seven trucks on a dirt road near the border with Russia where there are no border crossing facilities. The UAV was then re-directed south towards Nyzhniokrynske in order to continue observing the convoy. At 01.53, the SMM lost all communications with the UAV while it was flying over an area south-east of Nyzhniokrynske.